568 pages | 16 Color Illus. | 234 B/W Illus. "The fundamental and practical considerations of VLC systems with the used components and technologies in different application scenarios are a strong fact to publish and to buy this book. It is an ideal book for researchers working on VLC-related research projects, to deepen their knowledge of the field and to go into practical considerations. It is also an excellent textbook for graduate courses on the topic." 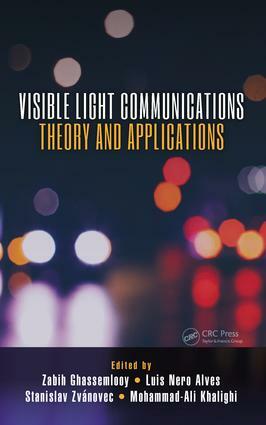 "This is possibly the first book which gives a comprehensive idea of the developments in the field of visible light communications. I especially like the approach of keeping the basics of VLC in the first five chapters, which is very useful for the beginners and research graduates in the field. The application scenarios are carefully chosen to be very contemporary. Topics like software defined VLC add an advanced dimension for the mature researchers in the field. This makes the book useful for all classes of researchers from novice to experienced." "To date, this book seems to be the most comprehensive book in VLC area. The authors have considered all existent and possible applications, scenarios, models, etc. to introduce VLC. Further, they studied modern concepts and technologies (usually borrowed from RF wireless) including MIMO, ITS, etc. in the same context. In addition, it covers the most recent researches in this area." Professor Zabih Ghassemlooy CEng, Fellow of IET, SM-IEEE: Received BSc (Hons) degree in Electrical and Electronics Engineering from the Manchester Metropolitan University in 1981, and MSc and PhD from UMIST in 1984 and 1987, respectively. 1987-88 he was a Post-doctoral Research Fellow at City University, London. 1988 joined Sheffield Hallam University as a Lecturer, becoming a Reader in 1995 and a Professor in Optical Communications in 1997. 2004 joined the University of Northumbria at Newcastle (UNN) as an Associate Dean (AD) for Research in the School of Computing, Engineering and Information Sciences. 2012-2014 he was AD for research and innovation, Faculty of Engineering, at UNN, UK. He now heads the Northumbria Communications Research Laboratories as well as the Optical Communications Research Group within the Faculty. His research interests are in optical wireless communications, free space optics, visible light communications. He has published over 550 papers (over 200 Journals, and 4 books) and have supervised 49 PhD students. Hs is the Vice-Chair of EU Cost Action IC1101. From 2004-06 he was the IEEE UK/IR Communications Chapter Secretary, the Vice-Chairman (2004-2008), the Chairman (2008-2011), and is Chairman of the IET Northumbria Network (Oct 2011-). Dr Luis Nero Alves graduated in 1996 and received his MSc degree in 2000, both in Electronics and Telecommunication Engineering from the University of Aveiro. In 2008, he obtained the PhD degree in Electrical Engineering from the University of Aveiro. His PhD thesis was on high bandwidth gain product amplifiers for optical wireless applications. Since 2008, he is the lead researcher at the Integrated Circuits Group from the Instituto de Telecomunicações – Aveiro. His current research interests are aligned with the IC 1101 COST action (OPTICWISE) on optical wireless communications, where he is an active member. Luis Nero Alves has also participated on several nationally (VIDAS, EECCO both from FCT) and internationally (LITES - CIP, PADSIC - FP7, RTMGear - FP7) funded research projects, and industrial contracts. Mohammad Ali Khalighi received his PhD degree in Telecommunications from Institut National Polytechnique de Grenoble, Grenoble, France, in 2002. From 2002 to 2005, he was with GIPSA-lab, Télécom Paris-Tech (ENST), and IETR-lab, as a postdoctoral research fellow. He joined École Centrale Marseille and Institut Fresnel in 2005, where he currently holds an Associate Professor position. His main research areas of interest include signal processing for wireless communication systems with an emphasis on the physical layer aspects of free-space, underwater, and indoor visible-light optical communications. So far he has coauthored more than 70 journal and conference papers on these topics. He has served as the Technical Program Committee of more than 15 international conferences and workshops in the communications area, and he is the TPC co-chair of the International Workshop on Optical Wireless communications (IWOW) 2015. He is also the vice-chair of Working Group 2 on “Physical Layer Algorithm Design and Verification” of the FP7 IC1101 COST Action. Dr. Khalighi is the recipient of the Scientific Excellence Award from the French Ministry of Research and Higher Education for the periods of 2009–2013 and 2013–2017.